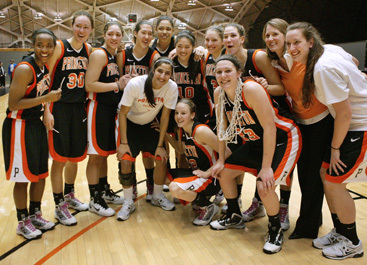 RETURN ENGAGEMENT: Members of the Princeton University womens basketball team celebrate last Saturday at Jadwin Gym after topping Harvard 68-59 to clinch their second straight Ivy League title. The Tigers, who improved to 23-4 with the triumph, were slated to end regular season play with a game at Penn on March 8 and then learn next Monday evening of their assignment for the upcoming NCAA tournament. More details on the win over Harvard in the Sports section. Despite the fact that Princeton Universitys plans for its Arts and Transit Neighborhood are still in flux, with Borough and Township officials meeting with University representatives to negotiate a plan for the University Place and Alexander Road corridor, representatives from the University presented a proposal for rezoning the area at last weeks Council meeting. At its monthly meeting last week, the Board of Education approved a tentative budget for the 2012 academic year and agreed to consider a proposal submitted by the Adapt and Reuse the Valley Road School Building (VRS-ARC) organization, describing potential rehabilitation and use of that building as a community center. We are three very different schools and thats why its so interesting to work together, observed French American School of Princeton head and founder Corinne Gungor in a recent conversation about the new Princeton Center for Arts & Education (PCAE) that will open late this summer on the site formerly known as St. Josephs Seminary. The two other schools participating in this adventure in education are the American Boychoir School and Wilberforce Academy. Dont be surprised if you see Einstein strolling around Princeton this weekend. What began last year as a one-day homage to Princetons most famous resident has turned into a weekend celebration of math, science, and Albert Einstein, with events beginning on Friday, March 11, and continuing through Monday, March 14. Youll hear no arguments about the saying success breeds success from the Princeton Charter School (PCS) chess team. Just a week after winning the New Jersey Elementary championship, team members went up against older competitors in the New Jersey Junior High School Championship tournament, and walked away with another first place finish to become the New Jersey Junior High School chess champions. Team members included Merrick Chang, Ashwin Dandamudi, Jonathan Yue, and Jay Yalamanchili, who also took home a trophy for placing eighth in singles. Playing in its first state tournament since the 2006-7 season, the Princeton High boys hockey team showed a flair for drama. The benefits of time off from ones high power daily routine have never been more important. With more and more people working longer hours, eating lunch at their desks, and most likely cutting back on sleep, the need for down time is not so much a luxury as a necessity, notes Veronica Krieger, owner of OnSen For All, the wellness spa located at 4451 Route 27 in Kingston, at the intersection of Raymond Road. Its setting in the historic Jedediah Higgins house, dating to 1705, makes it all the more appealing.